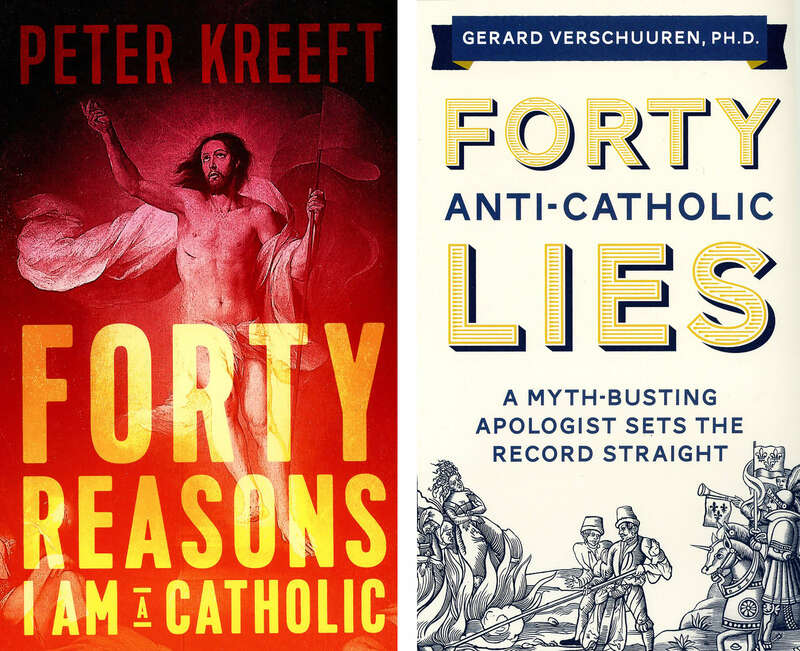 Photo Credit: CNS - These are the covers of "Forty Reasons I Am a Catholic" by Peter Kreeft and "Forty Anti-Catholic Lies: A Myth-Busting Apologist Sets the Record Straight" by Gerard Verschuuren. “Forty Reasons I Am a Catholic” by Peter Kreeft. Sophia Institute Press (Manchester, New Hampshire, 2018). 132 pp., $14.95. “Forty Anti-Catholic Lies: A Myth-Busting Apologist Sets the Record Straight” by Gerard Verschuuren. Sophia Institute Press (Manchester, New Hampshire, 2018). 341 pp., $19.95. Well-known philosopher and author Peter Kreeft and apologist Gerard Verschuuren both adopt simple yet at times challenging approaches to the truth of the faith. The short chapters and simple language make their books accessible to a variety of readers, from recent converts to those wanting to better present their beliefs to the perplexed. As apologists, both authors directly address contemporary post-Christian culture and the frequent biases and accusations against the church. Yet they do so without maligning anti-Catholics. They thus model a powerful way to carry out St. John Paul II’s new evangelization. Kreeft’s “Forty Reasons I Am a Catholic,” more personal than “Forty Anti-Catholic Lies,” given Kreeft’s reference to his own Catholic journey, addresses a wide range of issues, including secular society, infallibility, purgatory and Catholic community. This historical fact leads to an even greater point: “No effect can be greater than its cause … and the infallible is greater than the fallible; therefore, the infallible cannot be caused by the fallible.” Thus, when Protestants claim that the church is fallible, they are undermining their own understanding of the Bible. His confidence in the church never wavers. If the church’s claim about Jesus is wrong or untrue, “how to account for her wisdom, her holiness (her saints), her survival, and her fidelity to Christ’s teachings through 2,000 years of history?” This book adds a welcome dimension to Kreeft’s scholarly output. The author addresses Protestant concerns more than those of non-Christians, such as pointing out the “biblical” nature of Catholic spirituality. The author says the “gruesome lists of instruments of torture” that we have all heard of were post-Reformation fabrications. Readers will come to see that many of our Christian brothers and sisters have abused the truth in a centuries-long anti-Catholic campaign. Perhaps “40 Anti-Catholic Lies” can therefore be seen as an attempt at a painfully necessary aspect of ecumenism, where Catholics need to address biased Protestant perspectives with robust correctives. Both books would add greatly to the Catholic’s arsenal. The wide-ranging discussion of course comes at the price of in-depth discussion on any one topic, but the titles never promise anything but a survey. What they both do is whet readers’ appetites for greater in-depth discussion of widespread falsehoods regarding the Church and its teachings.